Another major coincidence day. Today is the birthday of two monumentally influential economists: Adam Smith (1723 OS) and John Maynard Keynes (1883). If I set my mind to it I would be writing for days about their respective theories, comparing them, and evaluating their strengths and weaknesses. I’m not going to, however. Even though it may look otherwise, this is, first and foremost a RECIPE blog and I want to stay that course even though I am patently easily distracted by history. I’ll paint in very broad strokes before I get to my recipe and you can delve the mysteries of economics on your own if you are interested. I make no apologies for being overly simplistic. It is a sad fact that most modern-day politicians are also overly simplistic when it comes to economics. I claim the right to be so because I am not making policy decisions that affect millions. Politicians ought to be more educated. 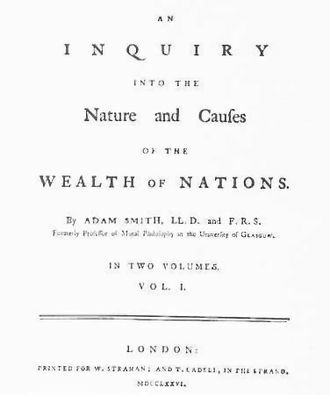 Smith’s magnum opus, An Inquiry into the Nature and Causes of the Wealth of Nations, generally referred to by its shortened title The Wealth of Nations, was first published in 1776, but went through many major revisions. Wealth of Nations presents considers such basic issues as what builds a nations’ wealth, the division of labor, productivity, and free markets. It is today a foundational work in classical economics. Smith’s thought is severely limited by the fact that he was writing at the extreme beginnings of the Industrial Revolution and so takes no account of the impact on macroeconomics of the factory system, mass industrial production and consumption, nor mass media and advertising. Smith is sometimes best remembered for his concept of the “invisible hand” (which he called AN invisible hand), even though he used the term only three times in his voluminous writing. The idea is implicit throughout, however. Smith argued that when left with substantial freedom, economic systems are able to regulate themselves. The ability to self-regulate and to ensure maximum efficiency, however, is limited by externalities, monopolies, tax preferences, lobbying groups, and other “privileges” extended to certain members of the economy at the expense of others. Smith’s most basic hypothesis is that rational self interest ultimately leads to an economy in which all benefit. Take a hypothetical man blessed with a ton of money. What should he do with it? Assuming he is self interested he will want to make a profit. He has a choice between hiring hundreds of (unproductive) servants or hundreds of (productive) workers. For comfort he might hire some servants but they produce zero profit for him. He is much better off hiring as many productive workers as he can. They have jobs, he makes a profit – seemingly win-win. Without regulation the system achieves a balance via the forces of supply and demand. Of course it’s not as simple as that, nor did Smith suggest it was. But that’s the core. It’s also the basis of Reaganomics or “trickle down” economics: make the rich richer by leaving them unfettered by taxation and whatnot and their wealth will naturally filter down to the benefit of everybody. I think we all see the inherent flaws in that mode of thinking. Keynes produced his most influential work The General Theory of Employment, Interest and Money during the Great Depression in 1936, challenging the ideas of the neoclassical economics of the time that held that free markets would, in the short to medium term, automatically provide full employment, as long as workers were flexible in their wage demands. He instead argued that aggregate demand determined the overall level of economic activity and that inadequate aggregate demand could lead to prolonged periods of high unemployment. 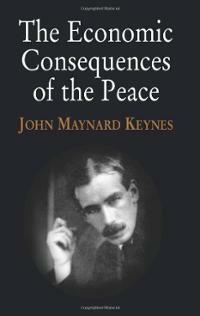 Keynes advocated the use of fiscal and monetary policies to mitigate the adverse effects of economic recessions and depressions. Classical economic theory had natural swings from boom to bust built in, and Keynesian models sought to flatten out these curves in the system through enlightened regulation. The “Keynesian Revolution” was associated with the rise of modern liberalism in the West during the post-war period. 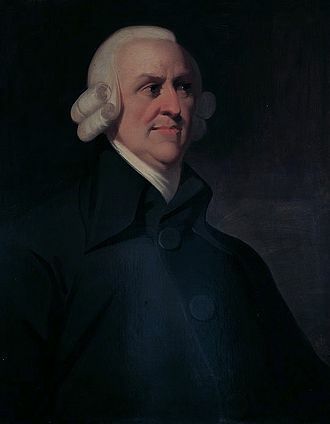 Keynesian ideas became so popular that some scholars point to Keynes as representing the ideals of modern liberalism, as Adam Smith represented the ideals of classical liberalism. After the war, Winston Churchill attempted to check the rise of Keynesian policy-making in the United Kingdom and used rhetoric critical of the mixed economy in his 1945 election campaign. Despite his popularity as a war hero, Churchill suffered a landslide defeat to Clement Attlee whose government’s economic policy continued to be influenced by Keynes’s ideas. As a not inconsequential side note Keynes thought that the pursuit of wealth for its own sake was a pathological condition, and that the proper aim of work was to provide leisure. He wanted shorter working hours and longer holidays for all. 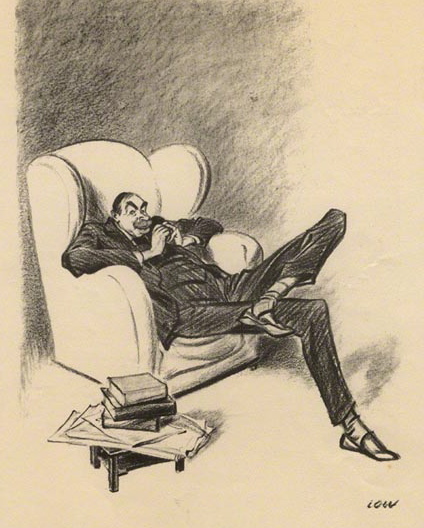 Keynes was interested in literature in general and drama in particular and supported the Cambridge Arts Theatre financially, which allowed the institution, at least for a while, to become a major British stage outside London. Keynes’s personal interest in classical opera and dance led him to support the Royal Opera House at Covent Garden and the Ballet Company at Sadler’s Wells. During the war, as a member of CEMA (Council for the Encouragement of Music and the Arts), Keynes helped secure government funds to maintain both companies while their venues were shut. 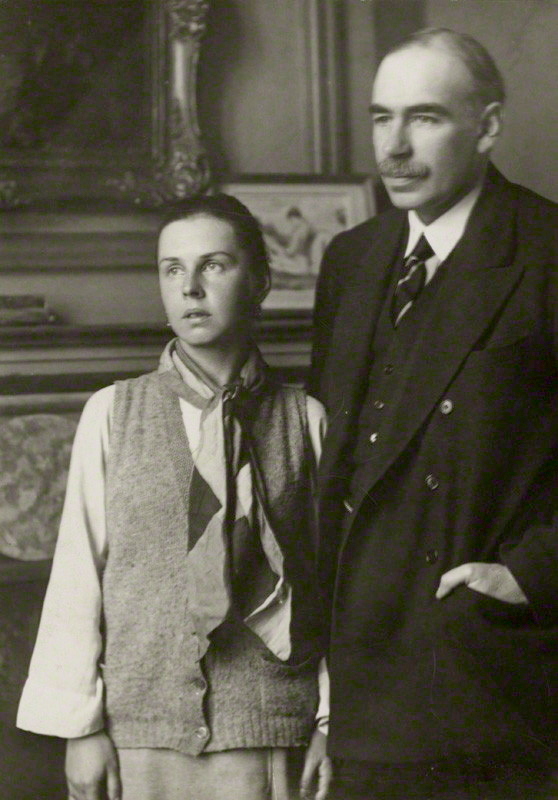 Following the war, Keynes was instrumental in establishing the Arts Council of Great Britain and was its founding chairman in 1946. Unsurprisingly, from the start the two organizations that received the largest grants from the new body were the Royal Opera House and Sadler’s Wells. Not only do Smith’s and Keynes’s ideas clash in government policies these days – head on – a host of other economic models vie for ascendancy. In the end, however, the unregulated free market versus enlightened regulation lie at the heart of the matter for the vast majority of people, including policy makers (none of whom appear to think very deeply about these matters). As an anthropologist I can’t help but notice that the role of culture is almost entirely absent from the theories of both men. Terms such as rational self interest, supply and demand, profit motive etc. are not culture-free terms. Max Weber, for example, pointed out that what counts as self interest is influenced by cultural factors. He noted that in modern economies higher wages could stimulate higher productivity whereas in what he called “traditional economies” the opposite is the case. The issue comes down to whether a culture works on the assumption that “more is better” or “enough is enough.” Weber argues that in modern economies the majority will always work more because the people want more, whereas in traditional economies people have a sense of when they have enough for their needs, and so will work only sufficient hours to get what they need. If you pay people higher wages in a traditional culture they will work less. It comes down to whether a culture is driven by need or desire. Their economies will be very different. Of course, for the West desire trumps need almost all the time. Gracias a dios, I escaped the endless desire for more and more a long time ago. Sure a Ferrari will get me from A to B very efficiently and I will look good to others in the process. But a Fiat will get me from A to B also; so will a bus or a bicycle. Nowadays you’ll usually find me on a bus when I need to travel – taking photos or reading a book. The economics of food shopping is by no means a trivial matter. I am always acutely aware of the price of various items. It’s not that I cannot afford to pay a lot for certain things, but generally I am not going to – except on special occasions. This is the main reason that I cook the way locals cook for the most part. This is not a rigid rule of course. I mostly cooked using Argentine staples when I lived in Buenos Aires, but I did make the occasional trek to barrio Chino to stock up on Asian foods because Argentine cooking is dreadfully bland. For me food shopping requires balancing three variables: 1. What I can afford (or what I am prepared to pay). 2. What I need for a healthy diet. 3. What I am in the mood for. On good days I can juggle all three nicely. Right now I’m preparing to leave Italy so another variable has entered the picture – part of the supply side. I have to use up a kitchen full of non-perishable foods such as rice, beans, lentils, pasta etc. or get rid of them. The canny wee Scot in me will not countenance throwing them out or giving them away, so my daily recipes feature a lot of rice and beans. But I don’t want to be dreary. I go to the market almost daily and hunt for special offers – especially overstocks of perishables that have reached their sell-by date. Supply and demand work to my benefit most days. This does mean that I cannot eat what I want, when I want, without paying the price. I live with that because I can always make something tasty with what I have. I could give you a recipe for my Stick Everything in a Pot Soup recipe I suppose, but the name pretty much says it all. The thing is that “everything” does not literally mean “everything.” It does mean putting things together that you do not normally think of as going together – for the sake of using them up. You can make an awful mess if you are not careful. Timing is paramount (as it is with markets). Meat, onions, and other seasonings go in first. Dried beans and pulses also need a lot of time to cook. Generally I don’t find that rice and pasta work well together in a soup. You can use one or the other, but their cooking times need to be carefully gauged so that they do not overcook. Same for vegetables. 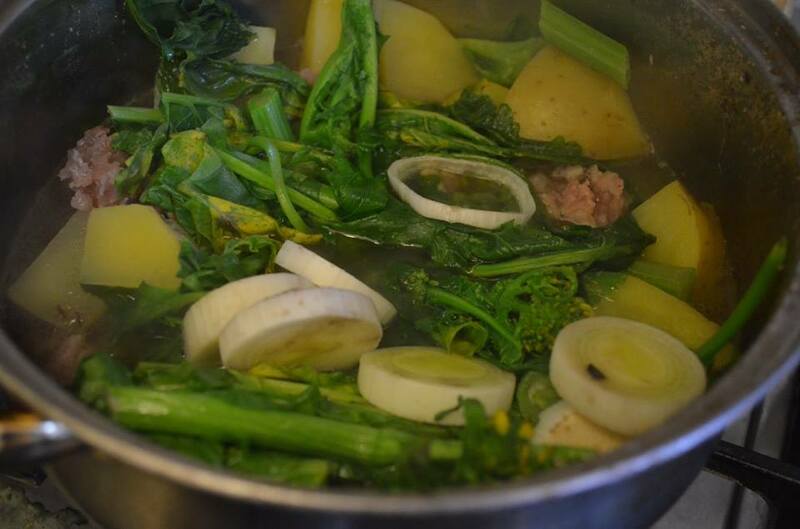 Usually I plan about 2 hours to cook this kind of soup and carefully plan (on paper) when I will add each ingredient so that I end up with a soup in which every ingredient is perfectly cooked, and not overcooked.